No matter what time of year it is, I love a warm, hearty breakfast. I could Sunday Brunch all week long. Not only is baked oatmeal an amazing morning comfort food, but this recipe in particular is simple, budget-friendly, sweet, and, although I wouldn’t call it a health food, it contains some healthy components (high fiber, cinnamon, fruits). Plus, it contains items you probably have in your pantry that you rarely use (ahem, that giant tin of Quaker Oats) (or is that just me?). Prepare this dish the next time you’re hosting company, or just bake it for yourself on a Sunday and enjoy it for the next few mornings. Dice two apples and place into a small mixing bowl. Melt half a tablespoon of salted butter and add to the apples. (You’ll need the remaining 1 ½ tablespoons of butter later; also melted.) Add one teaspoon of cinnamon to the apples and mix the three parts to evenly coat apples with butter and cinnamon. If you’d like to add a little spicy heat, grate 1 tablespoon of fresh ginger and add to this mixture. 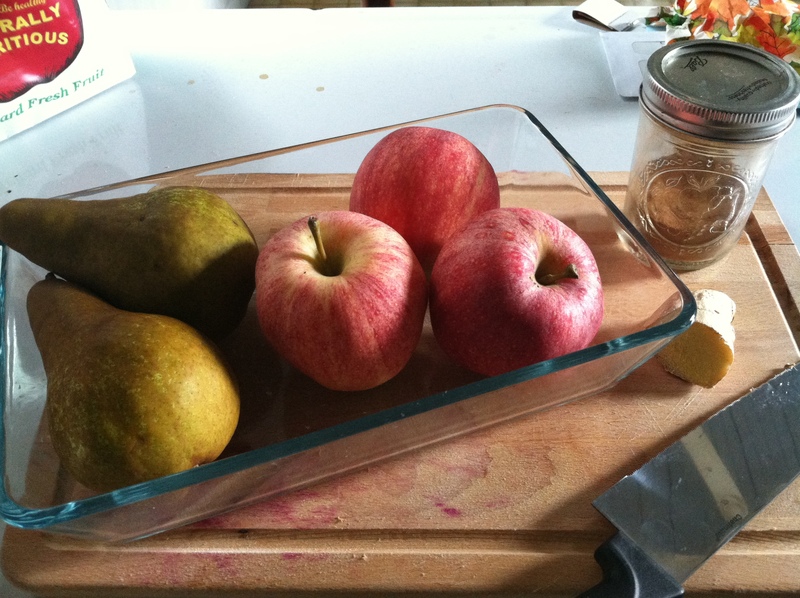 Holding the pears upright, thinly slice top to bottom, remove any seeds, and set aside. Don’t slice too thin; pears shouldn’t be translucent, but should be comparable to the thickness of three coins. In a separate mixing bowl, combine the dry ingredients (oats, baking powder, remaining cinnamon). In another bowl, gently beat the egg with a whisk, then whisk in the coconut milk, remaining butter (melted, but not hot), and honey until combined. Arrange the pears in a single layer in the bottom of the prepared baking dish. Cover the pears with half of the apples and the entire dry mixture. Add the remaining apples over top and slowly pour the wet ingredients directly over the oats. You want the oats to absorb as much as possible. Bake uncovered for 30 minutes, or until the oats and apples have become a golden brown. When you poke a fork into the center, the oats should have a cake-like consistency, not soupy. If still very liquidy, continue baking. While you’re baking, your kitchen will begin to smell like delicious apple cinnamon potpourri. This is why you’ll want a third apple on standby — slice into a quick snack to offer any hungry wanderers who follow their nose into the kitchen. When oats have set, remove from the oven and serve warm. Cover and refrigerate any leftovers.